A residential project in Riyadh executed by Rabiah & Nassar E&C. Rabiah & Nassar Engineering and Construction (Rabiah & Nassar E&C) is looking to capitalise on the growing demand in Saudi Arabia’s construction sector, building on the extensive experience of its parent firm Rabiah & Nassar Group (Ranco), which has been active in the market for close to eight decades. 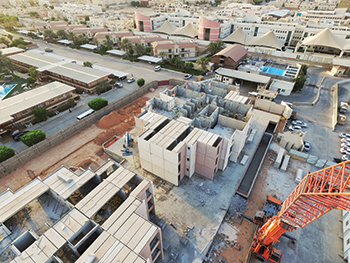 Saudi Arabia aims to build housing units, medical city hospitals, educational buildings, commercial projects and hospitality venues across the kingdom as envisioned in the country’s Vision 2030, said Engineer Waleed Al Mutairi, the company’s division manager. “Using advanced engineering modelling techniques and efficient execution strategies, Rabiah & Nassar E&C intends to help the country meet its goals, offering numerous services, such as urban design, architectural design, engineering, procurement, project management and construction execution,” Al Mutairi added. He said the company uses advanced engineering modelling techniques such as building information modeling (BIM) that complements suppliers’ working methods to actively reduce costs and the need to redesign. These techniques also improve coordination during construction, which helps maximise the project value and return on investment. In addition, they also reduce the cost of operation and maintenance of each project. “With the use of these modern engineering programmes, we fully analyse the building and avoid all possible errors during the early stage. We also match the building construction with the drawings during implementation,” said Al Mutairi. He pointed out that Rabiah & Nassar E&C handle projects using the SAP ERP enterprise resource planning system to integrate and properly manage each project through its different stages. This includes project management, cost allocation, scheduling, procurement, monitoring, controlling and reporting of each project. Rabiah & Nassar E&C is supported by a professional team including architects and engineers, handpicked to ensure that the company has the best workforce to take on any challenging and state-of-the-art projects. It also prides itself on the high-quality architectural design of its drawing office. “To achieve the ultimate quality of execution with the best value, we have built overlapping design and engineering expertise as a composite entity that is synchronous with overall construction project management,” he said. Furthermore, for residential projects, Rabiah & Nassar E&C offers architectural solutions that take into account the distribution and harmony between units, associated and recreational facilities and landscaping to create an exemplary and healthy environment, to meet the needs of different people of all ages and achieve maximum economic value. This apart, the company strives to develop a professional partnership with its clients, right from the design concept to the completion stage. “We have a unique ability to understand our client’s exact requirements, and provide them with plans that optimise on space utilisation, and reveal attention to detail and architectural richness,” Al Mutairi remarked. Rabiah & Nassar E&C has, in partnership with its affiliate Rabiah-Nassar & Zamil (Ranco Zamil) Concrete Industries, executed numerous projects that give high credibility to its engineering and construction capabilities. Ranco Zamil Concrete Industries is a trusted company with more than three decades of experience in providing prestressed and precast concrete systems. “In line with its continuous endeavour to adopt the latest technology, the company has built a state-of-the-art manufacturing facility for concrete batching and mixing plants, hollowcore slabs production lines, and a panel production factory with a pallet circulation system,” said Al Mutairi. Over the past years, due to Rabiah & Nassar E&C’s successful operation and constant innovation, it has been able to satisfy various clients and complete huge projects. “We aim to be an excellent engineering and construction company providing an efficient, sustainable, and cost-effective service of the highest quality. Against this backdrop, we will make every effort to implement the most challenging projects to help us become the Number One engineering and construction firm in the kingdom,” he concludes.